Accompanying my undertaking of Integral Theory courses online through JFK University, I experienced insights, questions, and variations on the usual themes touched in those courses. If you already are conversant with Ken Wilber’s Integral Theory, you might find this collection of reflections intellectually provocative and productive. Regarding the Heart Sutra in Vajrayana: Since form changes, it has no real substance and it is empty. Form is Emptiness-Emptiness is Form. Also, Wilber intelligently adds that modernity discovered that Form is Evolving biologically and in other aspects. This is an important observation that needs to be considered by Buddhists and others but I always felt particularly uneasy about the continuous need to counteract an alleged nihilism with which Buddhism can be interpreted. I found that there is a less known but historically important school of Tibetan Buddhism, one in which the concept of an essence is rescued. This would make Buddhism more compatible with Western and Indian forms of non dual mysticism. The once politically repressed Jonang Monastery espouses a tradition called “Maha Madhyamaka” which Wilber and other Integral thinkers would do well to revise to boost their discourse on Non Duality. It affirms that all phenomena are empty except that the Buddha Mind is not empty of itself. This has consequences. We need a clearer map of the subtle realms since they range from the archetypes to the lower astral, the psychic, the mental and may be combined in different proportions with physical matter, thus producing subtler and denser levels even of physical matter. After “achieving” union between the causal (almost non externally embodied) awareness and physical (more externally embodied) awareness, or between almost non relative and highly relative awareness, we may continue evolving (beyond separation consciousness) in the densest or in the more subtle varieties of physical worlds. We may also continue or express ourselves in higher subtle realms or (if we choose to) in lower subtle realms, to be of assistance. The gestures (or aspects) of holon expression and unfoldment also interpenetrate. They aren’t just simultaneous. They aren’t just correlated. They interpenetrate according to the logical possibilities available to polar pairs (interior-exterior, one-many). There’s also a “we” (and an “us”?) between the individual objective (UR quadrant) and the collective objective (LR quadrant). My brain, my atoms are connected to my inner subjective life but also have a participatory presence in collective gestures of reality. Perhaps the dialectics derived from polar analysis can be used to explore these aspects between upper & lower quadrants, both in the objective and subjective holonic aspects. Quantum entanglement (like holons) is both an ontological fact and a epistemological concept. It seems to apply to the relation between the individual objective (UR) and collective objective (LR) quadrants/gestures/aspects. 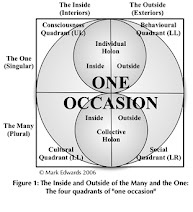 Maybe similar facts/concepts also apply to the relation between individual subjective (UL) and collective-subjective (LL) quadrants/gestures/aspects. Just as (probably in accordance to cosmological/physical theory) once all particles were one, all subjectivities could have been one. Perhaps dialectical polarity-based analysis applies to the relation between interior and exterior-based 3rd person explanations about reality. It may also apply to attempts to analyze the horizontal relations between the interiors and exteriors. In a way, the interiors and exteriors also are ‘explanations’ about reality. In Archie J. Bahm’s “Organicism,” the 8 more widespread metaphysical explanations produced in the human world (various metaphysical answers to what is the nature of reality) are distributed along two axes in specific positions that (in a lineal way complementary to the area-occupying quadrants of IT) derive (under a different nomenclature) from the subjective, the objective, the individual and the collective dimensions. The patterns observed by Wilber were analytically deduced by Bahm using what could be understood as the basis of holons: Complementary poles. This gives support to the possibility of a priori intelligible structures accompanying the observable, empirical, induced quadratic pattern. Paraphrasing Ken a little bit, basically he says that “the ‘we’ aspect is the mystery: God as a linking hyphen between you and I. 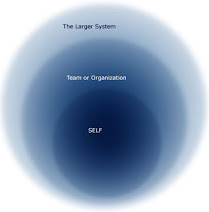 It is how Spirit is shared intersubjectively.” I basically asked: then how is Spirit also shared inter-objectively because why there are there detectable systems in every quadrant? Doesn’t this mean that quadrants interpenetrate in a way which is discovered not only by formal deductions but by dialectical implied relations? I see that this also means that the ‘implied’ represents a subjective aspect in inter-objective dynamics. What about genuine (occasionally physically and collectively) verifiable shamanic phenomena that transcend the limits of lineal time-space objective causality? What about possible genuine (still non-scientifically explainable, healing and otherwise) miracles, usually associated with Mythic or ‘Amber’ stage cultures? Can there be intervention upon physical matter coordinated by highly evolved beings in the higher subtle planes? What kind of interactions between subtle levels of matter and gross physical matter can explain any of these events? How much of the (now considered ‘non credible’ ‘otherworldly’) phenomena discovered in -once clearly established- cultural stages should be incorporated into a truly ‘Integral’ mindset? How ‘Integral’ can we really be if we push aside these matters as simply ‘societally useful’ ‘cultural’ ‘mythic’ and ‘pre-scientific’? How can our understandings of holonic unfoldment improve by considering inter-realm phenomena?